When looking to install a compact toilet that will complement your small sized bathroom and perfectly match its décor, the best one-piece toilet might be your ideal choice. This is because they come with a sleek and modern design that does not harbor bacteria and dirt, which makes it easy to clean. Identifying the right toilet for your bathroom can be hectic, especially because you will find many models in the market place. With keen research, however, you will find the right model that will perfectly suit your toilet and can offer you services for many years without issues. To present you a head start, we have researched and compiled a list of top ten one-piece toilets that you can consider choosing for your home. We have also provided you with vital information in the buyer’s guide section that will allow you to make your buying decision easier. WoodBridge T-0001 is a one-piece toilet that is luxuriously designed for those who love sleek modern designs that perfectly complement different bathroom styles. If you love a high-quality constructed toilet with a sleek look in your bathroom, this would be your ideal pick for improving your washroom beauty. One feature that stands out about this toilet is the soft closing seat. The soft close seat is ideal at preventing your seat from slamming down against the rim, thus eliminating the noisy bangs that come with a loose closing seat. Moreover, you won’t risk damaging or cracking your bowl. It also features a skirted trap way that not only provides a sleek modern look but also makes the cleaning a lot easier. Owing to the fact that it doesn’t have grooves and corners, you will definitely have a stress-free cleaning process. It comes with a siphon flushing design that is fully glazed to delivers super silent yet powerful flushing. This leaves you with no clog or leaks! Moreover, WoodBridge T-0001 is a dual flush system that uses the least amount of water for every flush. WoodBridge T-0001 comes with a compact size that won’t take much of your bathroom space. Besides, with a 5-year warranty, you will definitely have a long-lasting product in your home. 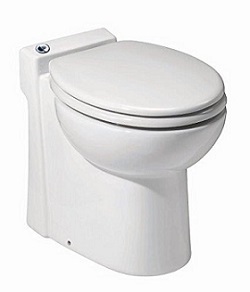 If you are looking for a high profile one piece toilet, then this might be your ideal pick. It comes with a high-efficiency flush system that uses as little as 1.28 gallons per flush, leaving you with a super clean bowl. TOTO MS604114CEFG is a features a rim with no holes, which makes your cleaning process simple while leaving your toilet with a seamless look. Moreover, the SanaGloss glaze prevents accumulation of debris, bacteria, and mold from sticking to the ceramic surface of the bowl. As such, your toilet is always clean and lasts for a long time. It also comes with a larger trap way as compared to the normal toilets, thus allowing more waste to exit the bowl at once. It has a universal height that provides a more comfortable seat position for a variety of users. It comes fitted with a SoftClose seat, which is the latest in the smart seat technology. The seat comes with a lid designed to fit well in the SoftClose hinge system that allows you to close the seat to the bowl slowly and quietly. It features an elongated bowl that is not only convenient for persons with physical challenges but also comfortable enough for any person as long as you don’t squat too far. This also makes it simpler for you to stand up. 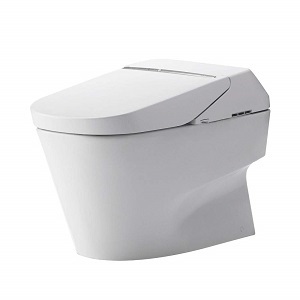 If you are looking for a toilet that is designed with the future in mind, this American Standard 2034.014.020 might be your most excellent choice. American Standard 2034.014.020 one piece toilet comes with a high-performing flush system that pushes water into the bowl up to three times faster compared to standard toilets. Furthermore, it delivers 360 degrees of water into the bowl leaving you with a cleaner flush without using a lot of water. It also features a comfortable height design of 16 1/2-inch that complies with the ADA of 1990. The Ever Clean surface is generally antimicrobial both in the inside and outside, which makes the cleaning process much easier. This surface also prevents the growth of stains, mold, mildew, and odor-causing bacteria. Even though it doesn’t come with a seat, you can buy one separately and can perfectly fit in the standard designed hinge system. Moreover, you can benefit from its 10-year limited warranty. This is definitely one of the top performing one-piece toilets that you can ever install in your bathroom. This is because it not only complements your bathroom décor with its beauty but also comes with a compact design that perfectly fits even in your small sized bathroom. The decorative one-piece toilet also comes with skirted design and a high profile tank. It also comes with an elongated front bowl with a SoftClose seat. This feature is designed to offer its users an unrivaled level of comfort. The cyclone siphon jet flushing system delivers an ultra-high efficiency flush that works without wasting water. The toilet is also easier to flush, thanks to the fact that it comes fitted with an automatic flushing mechanism. Besides coming with the SanaGloss finish, the toilet also remains new for a long time regardless of how you clean it. This is yet another high performing one-piece toilet from WoodBridge that features a clean sleek appearance that can complement any bathroom design. It is also constructed from high-quality materials and employs elegant craftsmanship to provide you with the greatest functionality and styling. 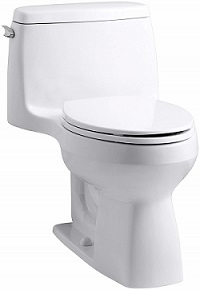 This easy to clean toilet has a well-designed skirted trap way that also gives it a sleek look. Most users, however, might be concerned that it has grooves that might harbor dirt and make it difficult to clean. It also features a Siphon flushing design that delivers a powerful flush. It is fully glazed for a super quiet yet powerful flush to deliver a clean bowl that leaves no clogs or leaks without wasting even a drop of water. It also features a high-quality Soft Closing Seat that is hinged on durable stainless steel. It is a quick release seat design that allows easy removal or tightening after years of use. What’s more, it comes with a comfortable seat height that will be comfortable for anyone to sit on and stand up from it. 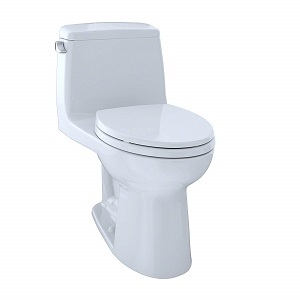 This model from TOTO is designed with a sleek high profile bowl one-piece toilet with a 12-inch rough-in. It is manufactured from high-quality material and a comfortable bowl rim height of 14 5/6 inches. It also comes with an e-max low water consumption siphon jet that uses as low as 1.28 gallons per flush, which means that your toilet stays clean without wasting water. It also features a patented super-smooth SanaGloss glazed trap way that inhibits bacteria and molds from growing on the ceramic surface. Moreover, SanaGloss surface ensures that your one piece toilet is always clean with less cleaning shifts. It is constructed with a solid high-impact plastic seat material that is specially designed to minimize injury while doing away with the annoying closing noise that might result from slamming. The seat also features a built-in SoftClose hinge system that allows a gentle and quiet closing. With the top fastening mounting bolts, you will be sure to have an easy installation process. This means that you don’t have to worry about hiring a professional plumber to have your toilet fixed. Furthermore, the toilet is comfortable and ergonomically designed to fit even in the smallest bathrooms easily. 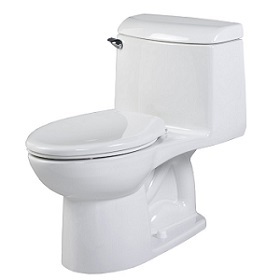 If you are looking for a simple and stylish looking one-piece toilet, then this is an ideal choice for you. 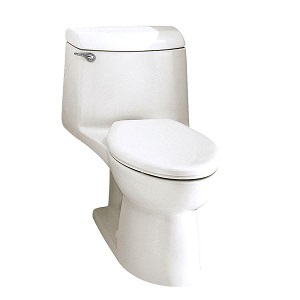 This toilet comes with an integrated tank and bowl to form a seamless and easy to clean design. Moreover, this model comes with a variety of colors such as black, sandbar, ice grey, diamond, and white. This means that you can choose the one that blends with your bathroom décor perfectly. The one-piece toilet from Kohler comes with a compact design that is stylish to fit in your bathroom perfectly and to conserve the much-needed space. The toilet also comes with a height that is capable of providing a comfortable sitting for elderly and physically challenged persons. Its height will allow you to sit on it and stand from it easily. Moreover, the elongated bowl provides extra-comfort. 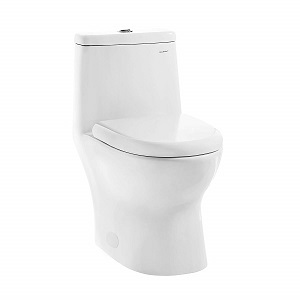 This Santa Rosa stylish one-piece toilet features a high performing flush that delivers up to 1.28 gallons per flush that leaves your toilet bowl clean and minimizes the wastage of water. In fact, this flushing mechanism is efficient enough to save you up to 16,500 gallons per year. The canister flush valve packs a powerful punch that does away with all the clogs while still using less water as compared to other ordinary toilets. If you are looking for a compact one-piece toilet that you can easily fit into small spaces when normal toilets don’t fit, then this Saniflo 023 is the ideal toilet to pick. This toilet features a self-contained design that uses no external water tank since its flushing system is inbuilt and is entirely electric. The one-piece toilet is designed with specific purposes in mind such as being ideal for limited spaces and saving of water. Additionally, all persons including the physically challenged can use the toilet easily. The model is easy to install even under the stairway for a half bathroom or as an additional half bathroom in a bedroom. What’s more, it can handle the waste coming from the bathroom sink to the toilet. The good thing is that it needs no toilet tank since it comes with a flushing action and its macerating pump cycle runs automatically after you have pressed the push button. Its electronic flush mechanism is also timed to allow you to use just one gallon of water per flush that ensures the toilet is clean and smelling fresh. Additionally, the discharge elbow located at the back can rotate easily to fit any type of installation needed. If you are looking for an easy to install a toilet that is also compact to fit even under your stairways or in the bedroom, this toilet could be your best bet. This model from Swiss Madison features a contemporary bold design that comes with two powerful nozzles that create a centrifugal force to deliver a high-quality and efficient flush. This powerful flushing mechanism leaves your bowl sparkling clean. 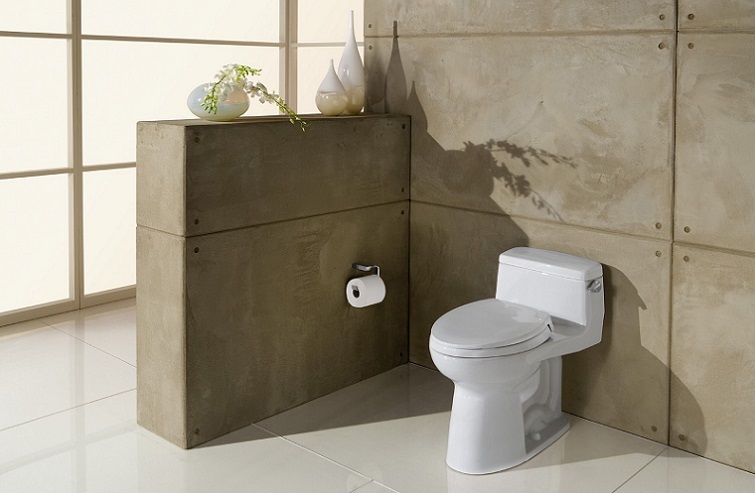 It also features a fully skirted toilet that offers a sleek look that is truly easy to clean. The sleek look also blends with any bathroom décor easily. The dual tornado flush also allows you to select between a partial and full flush and use either of the flushing modes without sacrificing the cleaning performance or increasing water wastage. It is made from high-quality materials that make it durable. It comes with a Soft Closing seat that closes slowly and quietly. As a result, you won’t hear any annoying noise when you slam the seat. The seat height is also comfortable, ensuring that you will find it easy sitting on it and standing up from it. Furthermore, the elongated bowl adds comfort to the user. This one-piece toilet comes with high performing features that allow you to have a comfortable time when using it. 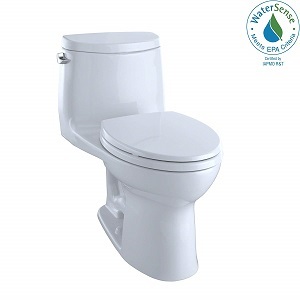 It features a four-inch accelerator flush valve that allows enough water to enter the bowl at a fast rate to deliver a flush powerful enough to ensure all the waste is eliminated at once. It also features a fully glazed siphon trap way that can effectively move a mass of waste 40 percent larger than a standard trap way. This makes it easy to eliminate all the waste with one flush, which means not wasting water by making many flushes. It also features an EverClean surface inside and outside the tank and bowl. With this unique surface, the toilet inhibits any development of odor or stains, thus making the cleaning process easy and ensuring that it stays clean for a long time after every cleaning. Although it doesn’t come with the seat included, this toilet features an elegant design and finish that will complement your bathroom finishes quite well. When buying a toilet, it is important to compare, assess, and evaluate the different one-piece toilet brands and models on the market so that you can be sure to pick the right model for your bathroom. With that said, below are remarkable of the things that you can look out for in a one piece toilet. 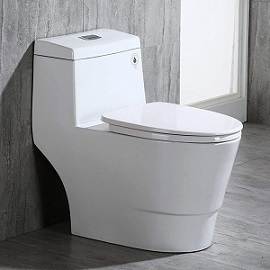 After reviewing different one-piece toilet brands, you will realize that there is a great difference in the flushing capabilities of various one-piece toilets across brands and models. In order to find out how the toilet you intend to buy reacts during flushing, place some sponges in the bowl and see if it clogs. Moreover, make sure to review how the flush cleans the toilet bowl as well as how it carries the waste down the drain. A great performing flush cleans the bowl effectively and leaves it unscratched. The flush also carries the material down the drainpipe without clogging the drainage system. Most people tend to believe that the more water they use in a flushing toilet, the cleaner it will be, but that isn’t always true. In most cases, toilets use almost 30 percent of water in a home, and this is quite a lot. To minimize this wastage, toilets have been designed to use less water per flush. One piece toilets with an efficient flush system come with a WaterSense label. As such, the toilet you intend to purchase should feature as low as 1.28 gallons of water per flush. This amount is sufficient to clean your toilet without clogging its drainpipes. As such, be keen when buying a water-saving toilet unit. When it comes to the toilet size, it is important to purchase a toilet that matches the current toilet rough-in measurements. Additionally, you should look for a comfortable height that will ensure you and your family members can sit on and stand up from the toilet easily. The most preferable height is 19-inches plus or minus a couple of inches. Your budget will also determine the price of the toilet you intend to buy. Indeed, you won’t want to buy a toilet that is way beyond your budget and neither will you settle on a cheap one. This means that everyone would like to settle for a fairly priced one-piece toilet. It, therefore, is imperative to find a high-quality toilet that will last long as opposed to a bad quality one that will break and leak, thus costing you more in repairs. When buying a one-piece toilet, you might want to weigh its benefits against those of a two-piece toilet. Both toilets serve the same purpose and come with almost the same flushing mechanism. Moreover, they are installed following the same method. However, it is wise to look at how they compare with each other. A one-piece toilet is slightly smaller as compared to a two-piece toilet. This is because its tank comes fused with the bowl and sits lower than the two-piece toilet. Owing to its smaller size, the one piece toilet is often ideal for installation in smaller bathrooms since they don’t need a large space. Moreover, its small size is ideal for use by small children and disabled individuals since its seat and handles are placed low. The one-piece toilet features fewer gorges and nooks as compared to a two-piece model, and these make it easier to clean. However, the fact that one piece toilets are low and close to the floor makes them difficult to repair because they might require uninstalling before repairing. Unlike the one piece toilet, the two-piece type is much easier to repair. Owing to the fewer fittings in the one piece toilet type, maintenance is a bit easy. However, maintaining a two-piece toilet might be slightly difficult, especially in the tank and the joint areas. Owing to the fact that one piece toilet comes in a solid piece of ceramic and with a concealed flushing system and pipes, it will last longer as compared to the two-piece toilet that has a separate water tank and an exposed flushing system. In terms of prices, one-piece toilet types are often more expensive as compared to two piece types. This is because they are designed and constructed in a more solid way besides having a more modern look and feel. Due to the fact that you will be handling a single piece, installing a one-piece toilet is relatively easier when compared to the two-piece type. Nonetheless, they are a bit bulky as compared to the two-piece toilets. As such, you might consider having more hands helping you when installing the toilet. From this comparison, it is clear that the one-piece toilet is more advantageous in many aspects. Although its cost might be too high for some people, you will definitely get a more durable one-piece toilet. Q: Is there any difference between a two-piece and this one-piece toilet? Ans: Typically, toilets come in two types: one piece toilets and two-piece toilets. The difference between the two types is that a one-piece toilet comes with a fused bowl and tank whereas the two-piece type comes with a separate tank and bowl. Q: Is it easy to install a one piece toilet? Ans: Majority of one-piece toilets are relatively easy to install even without hiring a professional plumber. Nonetheless, it is important to hire a plumber to get it installed rather than doing it yourself and voiding the warrant. Q: What is the most comfortable height of a one-piece toilet? Ans: Each person’s comfortable height is different. However, taller persons and the elderly benefit from a toilet height of 17 to 19 inches. On the other hand, children and small-sized individuals can be comfortable with a height of 15 inches. With this review of ten of the best one-piece toilets, we believe that you will find the right one-piece toilet to fit in your bathroom. The information that we have also provided in the buyer’s guide can be crucial at narrowing down your choices. However, if you still find it challenging to go round the stores, consider picking one of the ten reviewed products since all of them will serve you well enough.